Talk to me about Exotics? Weekend_Warrior replied to TWar's topic in What's In Your Bag? I play one of their 3 woods. I'll echo what some others have said; it's a great club with exceptional distance. Sometimes I wonder why I even keep a driver in the bag. Something I don't know if others have mentioned is the lifetime warranty. One day I teed off with the 3 wood and it felt like a mishit, when I leaned over to pick up my tee and used the club to sort of balance myself the shaft broke off right at the hosel. I was bummed, but when I went to the golf shop where I got it to get the shaft replaced, they told me about the lifetime warrantee and took care of it for free, and it wasn't a cheap shaft. Weekend_Warrior replied to No3PuttLaLa's topic in What's In Your Bag? This time of year is the worst. The weather teases some warm days and then throws some cold/snow/rain/ice. It is also when I feel the most urge to spend money on golf equipment. This year I've replaced my 3 hybrid with a Mizuno MP18 Fli Hi 3 iron. I'm excited about this one as I jumped on the hybrid wagon about 3 years ago and have never been comfortable with it, so going back to an iron I think will be good. Also, this year I am retiring the Ping Hoofer bag I've used for the last 17 seasons. 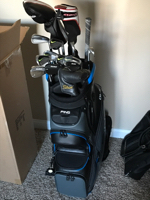 We ride a lot these days, and when I walk I use a push cart now; so I've upgraded to a Ping DLX bag this year. Now if this Iowa weather would just cooperate I could stop spending money on equipment and start spending money on greens fees. Yeah spin can cause a difference in distance. It sounds like you were both hitting different 3 woods (brands and setups) and since it is two different people's swings it would be hard to say that spin was specifically the culprit in your scenario. That one shot you wished you had, and how to get it. Best round with a OMG shot, what was the shot?